The Tattersalls October Book 1 Yearling Sale (9-11 October) saw a very vibrant half an hour of trade this afternoon, with three Lots making seven figure sums in quick session, topped by a son of Galileo x Shastye (Lot 109) selling for 3,400,000 guineas (US$4,693,047). 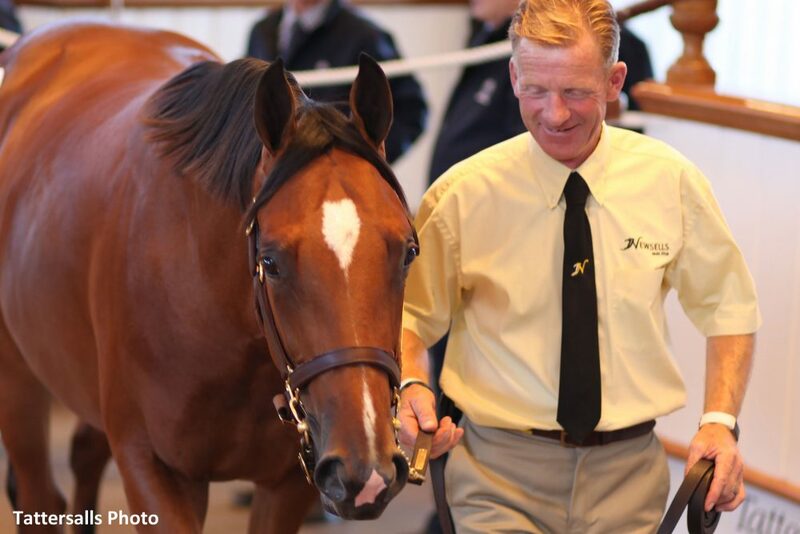 Bidding for the strapping colt, consigned by Newsells Stud, developed into a head to head battle between MV Magnier and Mitsu Nakauchida, a racehorse trainer in Japan, with the Coolmore team providing the final winning bid and securing the colt. Coolmore is no stranger to this outstanding racing family and has previously purchased two yearlings out of top mare Shastye, including Sir Issac Newton and recent Group 2 Beresford winner Japan. It was the mare Shastye's fourth yearling to fetch over a million guineas in the Tattersalls sale ring, with a top price of 3,600,000 given for Sir Isaac Newton as a yearling. Julian Dollar of Newsells Park Stud said: “She is a wonderful mare and the pedigree says it all, but timing is everything and Japan's Beresford win two weeks ago just revitalised everything and brought back some interest and vibrancy to the pedigree. “This is a lovely colt, and has always been a lovely horse, though maybe not as pretty as Sir Isaac Newton, he is strong and athletic. I think that Aidan believes he did not get it quite right with Sir Isaac, so Coolmore was happy to come back again – I also know that Ballydoyle holds Japan in high regard. This entry was posted in Bloodstock, NL List and tagged coolmore, galileo, Japan, Julian Dollar, m.v. magnier, mitsu nakauchida, newsells stud, shastye, sir issac newton, Tattersalls, yearling, yearling sales by Press Release. Bookmark the permalink.